Disclaimer: This post is unrelated to the TV show Top Gear and the sacking of Jeremy Clarkson as host. 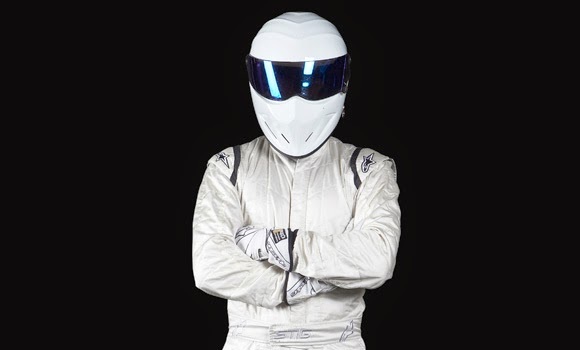 If you are researching the real STIG trying to find out his/their identity then please look elsewhere. 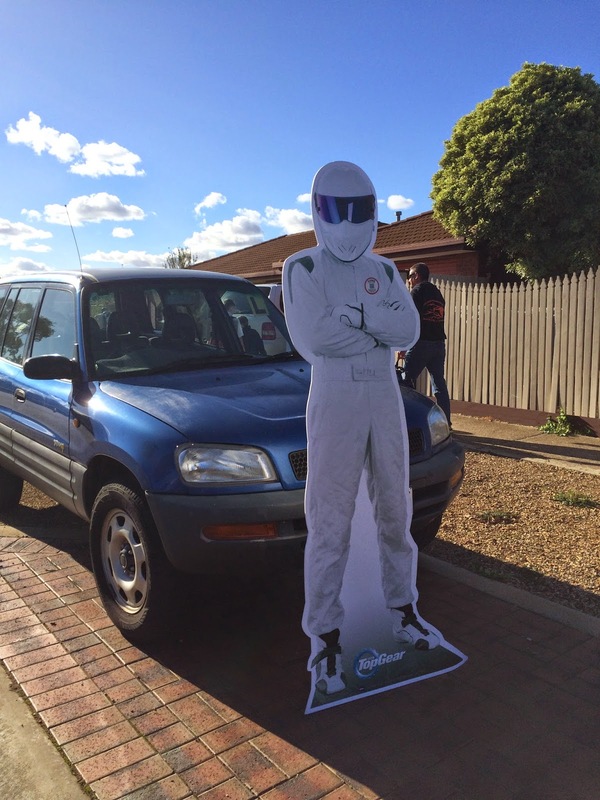 This post relates specifically to a 7 foot STIG cardboard cut-out that lives in my house. If this slightly strange situation intrigues you (seems quite normal to me) then please read on. You know how you have those visitors that stay just that little bit too long. Well STIG has become one of THOSE visitors. He's been in residence in our lounge room since Oct last year and has become so much a part of the landscape that when visitors walk in the front door they actually greet him seemingly before even us. I think it just might be time for him to leave. You have no idea how much those folded arms came to irritate me. If you don't have a clue about who or what i am talking about then read my post (here) and you'll know that he was always intended to take up residence in Tom's new bedroom suite (well that's what we are calling the two bedrooms made into one that has a bed at one end and a lounge and TV at the other). 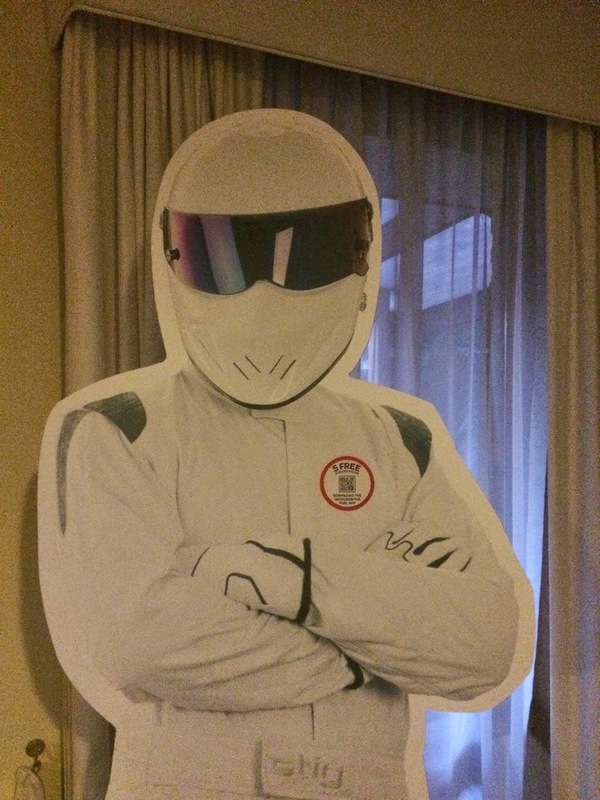 Tom is now 18 and he has given every indication that while he still enjoys Top Gear (belly laughing uproariously at each episode) the idea of having STIG in his suite has waned. Egads, is my little boy growing up? Put your hand up if you are the mother of a boy! So how best to dispose of STIG? I'm not so removed from the show that has given me the odd cause to giggle that i would just throw him in the bin. Surely, he could bring joy to some other child? Is there another mother out there that would allow a 7 foot effigy of a TV personality to take up residence? Or perhaps he would be better appreciated by some ageing "rev head" with pride of place in their garage among the beer cans and the footy and motor sports paraphernalia. I've checked with the neighbour's children and nope, despite the excited bulging eyeballs and raised eyebrows on the children, the look of horror on the parents faces over the top of them was enough to tell me that it wasn't going to happen. So my next course of action is to leave him out the front of the house and wait say........all of 2 seconds before he is lifted off the side walk. Truly, this is what happens. Its "magic" i tell you. Anything place on the nature strip disappears seemingly before our eyes. Even bulky wooden L shaped desks that weight a tonne. Old rusty BBQ's start making their way down the street while i chase after them shouting "do you want the lid?" Drat if it wasn't a windy day and he fell over. Imagine my grumpy face as i pick him up and trudge back in the front door with him. I refuse to drive it, I have my standards. Oh, you are going to pay me? How much? Then i remembered that the new neighbour next door is studying film & movie special effects and still thinking (Oh, that's why i have a headache) i thought the rather sturdy frame that holds him upright might come in handy. (Pause for a few minutes while i run next door). Matt just left with STIG under his arm. Lucky he's a big dude. He tells me it will come in handy and also he might have some fun with STIG for a while. Be my guest. I also noticed that their lawns/weeds are getting rather unruly and so i asked him he if wanted to borrow our underused lawn mower. His eyes lit up. Having given up work to study, two small children and just having moved from NSW, they are strapped for cash. You know how i feel right now? I feel so great that i could help someone. Why do people take drugs and get drunk to feel good when they could feel like this just by helping someone. It hasn't cost me a thing! Goodbye STIG (and good riddance).